The KTM 790 DUKE is devastatingly accurate. The agility you'd expect from a single, blended with the meaty punch of a twin. It carves corners with pinpoint precision, boasting the all-new 799 cc LC8c parallel twin motor nestled into one of the lightest and most compact chassis around. The KTM 790 DUKE is all about being fast where it counts – in the corners. Dynamically flicking from one bend to the next, putting you in the heart of the action and not on the sidelines. 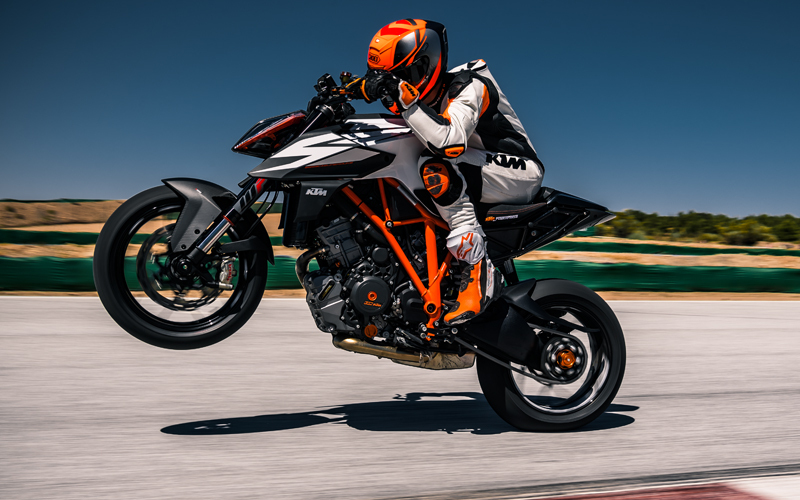 Designed to deliver confidence-inspiring control for a wide range of potential riders, the KTM 790 DUKE's sleek body offers the ease-of-movement needed to effortlessly direct The Scalpel's dynamic movements out on the ride, while still allowing fine adjustability for comfort – whatever your skill level. The hunkered-down aggressive stance of the KTM 790 DUKE is intimidating to all who cross its path. It clearly takes some of its design cues from the KTM 1290 SUPER DUKE R – most obvious being the unique headlight 'face-mask'. Its distinctive sharp lines and compact 11/13 proportions are set off by signature KTM graphics, which leave no doubt as to its road-dominating intentions.